Abigail Reynolds worked with volunteers to transform the gallery space at The Exchange for The Penzance Convention and to construct the cinematic environment for the Extraction: Projection exhibition. Entitled Extraction/ Exchange, the installation referred to disparate sources, from picture palaces to modernist architecture, as well as bringing in local references such as Gwennap Pit and the Minack Theatre. Reynolds used materials close-to-hand, easy to work and universally available: pallets, corrugated cardboard, recycled wood. The plywood donated by a building firm had been treated with a copper-based preservative to protect it from rot and infestation; the green of the copper salts was assimilated into her design. Starting with a seating bank for the Extraction: Projection exhibition, the installation was later expanded for the three-day conference, The Penzance Convention. Abigail Reynolds was asked to undertake this commission partly as a means of addressing The Exchange gallery’s harsh acoustics. She worked closely with the form and acoustics of the space to soften both, aiming for a space that would feel intimate, familiar, muted, and convivial. Her installation was designed as a container for the works shown. Fluted cardboard panels rounded off the corners of the gallery, repeating the dimensions and angle of the back left corner of the gallery. This device further softened the acoustics, preventing sound from bouncing into the corners of the space. Reynolds has worked on large sculptures for public galleries, (most notably with corrugated cardboard for the sculpture Mount Fear in 2002) and on tiny folding collages. She enjoys these discontinuities in scale. For the last five years she has focused on working with photographs found in books, folding them together, and has also brought events to Assembly in St Just, a converted chapel in which she hosts residencies. 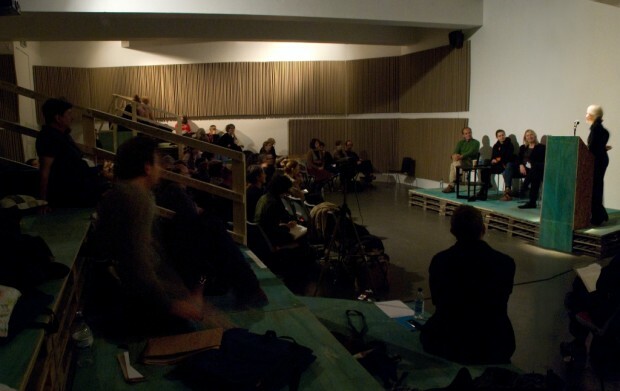 ‘Slow Time’ is an ongoing series of interdisciplinary talks focusing on time in the creative process. Some twenty volunteers helped to make the installation. Wall panels were constructed from folded corrugated cardboard. 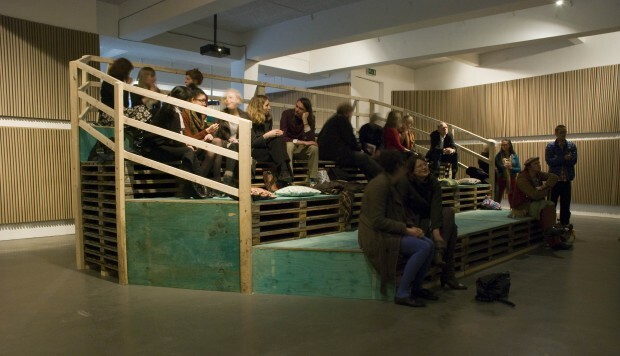 Platforms for seating were built from pallets and recycled plywood by gallery technicians Nick Brierley and Roger Weisman. The cushions and curtains were sewn in group sessions at The Exchange organised by Kirsty Lowry and led by Ann Haycock. The fabric was all donated.